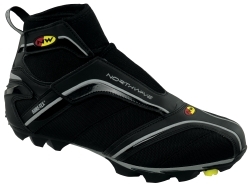 Northwave Bike Shoes would like to introduce to you our Celsius J GTX winter mtb cycling shoe. The well crafted cycling shoe is has a Gore-Tex® membrane to ensure that your feet stay dry and warm against cold conditions. Using Gore-Tex not only repels water on the outside, but is breathable so that moisture does not retain on the inside, keeping your feet warm and dry. Crafted with only the finest materials, the Celsius J GTX is designed with the Jaws Sole, which was constructed to mimic the traction on mountain bike tires. Constructed with all natural rubber soles for maximum grip, the traction and stability of the Jaws Sole will outlast the competition in rain or snow. Available in stores now, the Celsius J GTX is a must have for the winter season. Not only is it reasonably priced, but this quality built shoe will keep you warm and dry throughout the cold winter season. Also available in a road version, the Fahrenheit is the perfect winter shoe for making long treks in adverse conditions. For more information, please go to our website: www.northwave.it. Available in sizes 39-48 and half sizes 39.5-45.5.